Featuring built-in support for stereoscopic/3D footage, it is a full-fledged stereoscopic editing system. It is also compatible with a wide range of effects plug-ins. It features a multicam editing mode for cutting between 9 cameras simultaneously. For audio support, Media Composer 7 features built-in 7.1 surround sound support and audio mixing of up to 64 audio voices. It also features improved audio keyframing on the timeline and supports Pro Tools RTAS plug-ins. It supports available Avid and non-Avid hardware I/O cards and devices and comes bundled with Avid FX (Boris RED), Sorenson Squeeze, and AVID DVD, which allows you to author DVDs. This upgrades versions of Media Composer prior to 6.5 to Media Composer 7 Interplay Edition. This version is compatible with available Avid Interplay solutions, which provide enhanced access to media, ingest automation, distribution, analytics, and rights management. Transcode files placed in the folder to a specified resolution. Copy files to a specific location. AMA Media is now tracked and can be loaded into Bins and the Media Tool, and in Avid interplay (if installed). Background services such as AMA Media and Dynamic Folders run in the background and can now be started and stopped from both outside and inside the edit system interface. Media Composer 7 supports non-destructive addition of 1D and 3D LUTs (Look Up Tables) for making quick adjustments to you image. This is extremely useful when working with RAW footage, which tends to appear washed out, and allows you to work with your footage in a familiar color space, such as REC 709, and still make final color corrections later. Audio gain can now be adjusted on a clip-by-clip basis in the timeline. You can now highlight AMA clips used in the timeline in red, so you can tell which clips on your timeline are not playing back in Avid's native file format. You no longer need to use a modifier key to use the mouse scroll wheel to navigate. The 64-bit architecture of Media Composer provides more processing power, larger editing bins, and a smoother editing experience with less waiting than with a 32-bit system. Media Composer works as a standalone software editor, but it will also interface with available Avid I/O devices and control surfaces to expand the capabilities of your system. Additionally, using Avid's Open I/O, select third party I/O devices from AJA, Blackmagic Design, Bluefish444, Matrox, MOTU, and Mbox can be used with Media Composer. With support for 4:4:4 HD-RGB color and DNxHD 444, you can work with virtually any media, from analog to the latest formats and codecs, while preserving the full-quality color detail from beginning to end. Media Composer 7 offers ACE-certified editing tools and a wide range of features, workflows, and options. Media Composer enables you to work the way you want. Trim and manipulate on the fly using the Smart Tool or perform ultra-precise edits using traditional tools. Mix and match media formats, frame rates, resolutions, and more in the same timeline without rendering. You can edit HD material in real time -- in mastering picture quality -- using Avid DNxHD or DNxHD 444. Edit stereoscopic 3D material as quickly and easily as you do with standard 2D footage. Capture, edit, and manage the complete 3D end-to-end workflow. In addition, you can mix and match 2D and stereoscopic 3D clips on the same track, and it features full-fledged editing tools and video effects for stereoscopic post production. It features a multicam mode, allowing you to edit with footage from up to 9 camera positions at the same time. Multicam now supports long GOP codecs such as XDCAM. Media Composer 7 features an advanced 10-bit color corrector that allows you to accurately match colors from shot to shot using NaturalMatch. It supports 4:4:4 HD-RGB color space processing with keyframable color correction. With advanced relink support, you can dynamically reconnect clips to the original or new media using a wide variety of common metadata fields. With the new hardware release control, which works with Avid and third-party I/O hardware, you can activate/deactivate your hardware -- without disconnecting it -- to access software-only features, such as full screen playback mode and audio project settings options. You can also share your third-party hardware and monitor between Media Composer 6.5 and other applications without quitting or rebooting the software. With audio keyframe enhancements, you can now copy, paste, cut, move, and adjust audio keyframes -- including groups -- anywhere on the timeline. You can even delete hidden audio keyframes that can occur as you trim a clip. Monitor more complex soundtracks with support for up to 64 audio voices. Combined with robust audio tools, 7.1 surround sound and RTAS plug-in support, and unmatched integration with Pro Tools. Avid Media Access (AMA) allows you start editing immediately, without transcoding media to the DNxHD, the native Avid file format. This allows you to mix and match different formats, resolutions and framerates on the same timeline and edit as if all the files had the same resolution, file format and frame rate. AMA files behave the same as AVID DNxHD files, allowing you the flexibility to work with almost any file type with minimal performance sacrifices. You can also select edited clips in the timeline, and have them rendered to Avid's native file format. MC 7 will automatically update the clips when the background transcode is complete. Avid Media composer allows you to work with SD, HD, 2K, 4K, and 5K resolution. You can use AMA to export files back to the media's original source format for archiving or final delivery. You can create AS-02, JPEG 2000, DNxHD, AVC-I, and other file-based media volumes for roundtrip workflows, sharing, or archiving. Edit titles directly from the timeline and automatically relink to all AMA QuickTime files. Media Composer 7 supports AS-02/AS-11 MXF formats, which allows you to manage multiple versions of the same sequence without duplicating assets, saving storage space. You can also move content between Avid and other systems that support AS-02/AS-11. Use JPEG 2000, DNxHD, IMX, AVC-Intra, and uncompressed media in your AS-02/AS-11 workflow. Encode and decode sequences -- in mastering quality -- using the JPEG 2000 codec, which helps preserve the quality of archival content. Active Format Description allows you to select image settings that carry display information in the output file. This information can be used to protect the way your project is displayed, even if down converted or displayed on a device with a different aspect ratio. 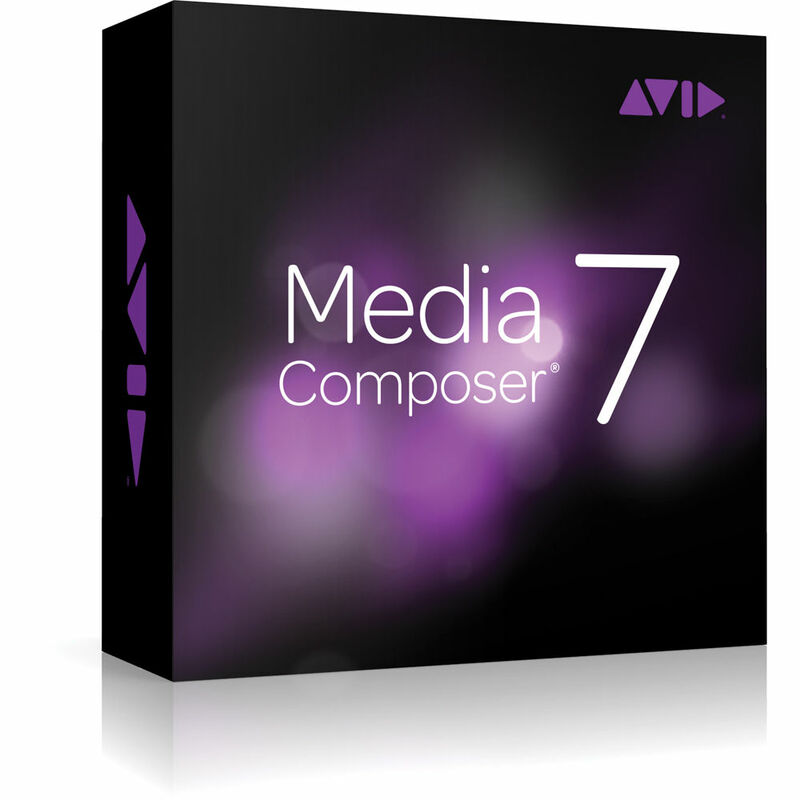 Media Composer 7 includes Avid FX (Boris RED), Sorenson Squeeze, and Avid DVD. Add visual drama and depth with the built-in 2D and 3D effects, title tools, transitions, keying, and motion effects. Track and stabilize motion. You can author DVDs and optimize media for high quality playback -- online or on disc. Author professional DVDs using Avid DVD, which works with Windows-based systems and Windows emulation on the Mac. With Sorenson Squeeze, you can optimize content in a variety of formats, including HD, DVD, MPEG-2, MPEG-4/H.264, Flash, and 3GPP. Media Composer 7 integrates with Avid Marketplace so you can browse for stock footage, plug-ins, hardware, and training videos without opening another program. Media Composer 7 allows you to share audio mixes with Pro Tools editors and vice-versa using AAF. Computer Avid-qualified Windows- or Mac-based computer. Note: video on laptops is limited to 1 stream of uncompressed SD video, except for Windows-based Intel Core i7 laptops (Quad Core with Hyper-Threading) with eSATA storage, which can play multiple streams. Mac OS X Lion and Mountain Lion (64-bit). Note: Avid does not supply support for non-Avid-qualified systems. NVIDIA cards are recommended; full-screen playback requires a minimum of 128 MB of graphics memory.